When we posted the “Corporate Debt Bubble” in early October, high yield spreads were still stubbornly holding near record tight levels despite notable weakness in the investment grade market. 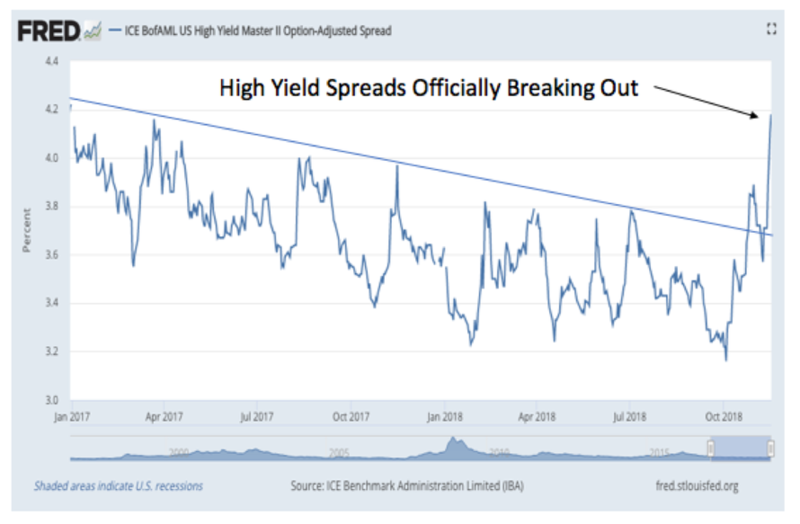 That has changed rather quickly during the last few weeks, and it’s now safe to say that high yield credit spreads have officially broken up through the well-defined downtrend that held steadfast during 2017-2018. 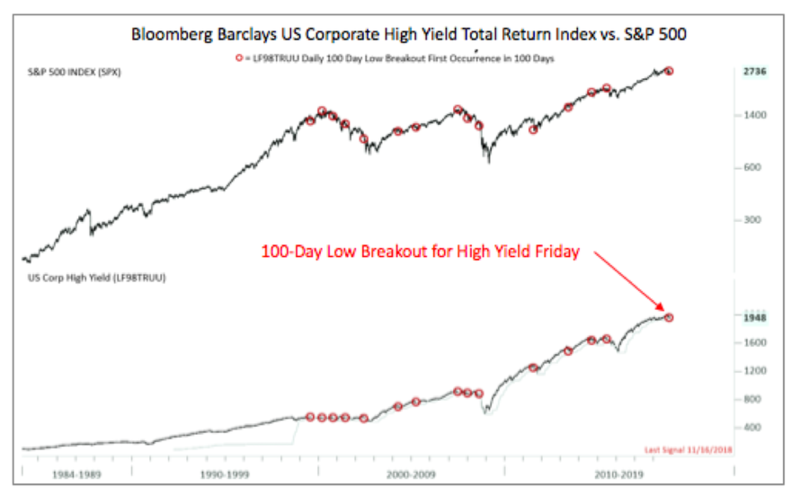 This recent stress, though modest so far, has led to a new 100-day low in the Bloomberg Barclays US Corporate High Yield Total Return Index (LF98TRUU) for the first time in 100 days. Our systems flagged this signal on Friday, and it’s worth noting that forward returns out 6 months for both stocks and high yield have been significantly below average after such occurrences in the past (most recently in July of 2015). Conversely, forward returns for Gold have been pretty bullish. Intuitively this makes sense, as a peaking US dollar in the face of weaker growth would be the rocket fuel Gold has been lacking. Add to that a Fed who seems to be caving (at least a little) as everyone from the President to Jim Cramer screams at them to stop hiking, and you could have a big move coming for Gold / USD. Studies below. Observation not recommendation. Stay thirsty my friends. NOT INVESTMENT ADVICE. NOT A SOLICITATION FOR ANY SERVICE.